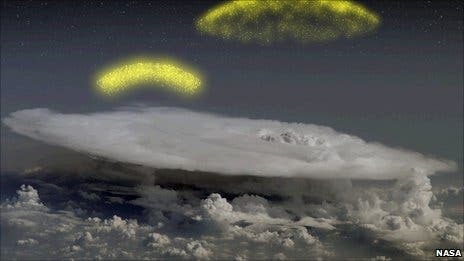 "We see gamma-ray bursts, one of the most distant phenomena we know about in the Universe, we see bursts from soft gamma-ray repeaters in our galaxy, flashes of gamma rays from solar flares, our solar neighborhood — and now we're also seeing gamma rays from thunderstorms right here on Earth," Julie McEnery, Fermi project scientist at NASA. A space telescope has accidentally spotted thunderstorms on Earth producing beams of antimatter. Such storms have long been known to give rise to fleeting sparks of light called terrestrial gamma-ray flashes. But results from the Fermi telescope show they also give out streams of electrons and their antimatter counterparts, positrons. It deepens a mystery about terrestrial gamma-ray flashes, or TGFs — sparks of light that are estimated to occur 500 times a day in thunderstorms on Earth. They are a complex interplay of light and matter whose origin is poorly understood. Thunderstorms are known to create tremendously high electric fields — evidenced by lightning strikes. Electrons in storm regions are accelerated by the fields, reaching speeds near that of light and emitting high-energy light rays — gamma rays — as they are deflected by atoms and molecules they encounter. These flashes are intense — for a thousandth of a second, they can produce as many charged particles from one flash as are passing through the entire Earth's atmosphere from all other processes. The Fermi space telescope is designed to capture gamma rays from all corners of the cosmos, and sports specific detectors for short bursts of gamma rays that both distant objects and TGFs can produce. "One of the great things about the Gamma-ray Burst Monitor is that it detects flashes of gamma rays all across the cosmic scale," explained Julie McEnery.